Powerful, intuitive and awesomely geeky, it's a must for pros, but overkill for the average muso. Endlessly configurable. Really easy to use. Meter Tap and LHG automation. Available on its own and included in the Advanced version of iZotope's Ozone 5 mastering suite, Insight is an analysis and metering plug-in for audio production and broadcast applications. Based on Ozone's Meter Bridge component, it comprises five modules, any number and combination of which can be opened in the resizable main window at once. "iZotope's well-stocked library of task-specific presets is onboard"
To enable a module, simply click its button at the bottom of the interface to open it in the main window, automatically resizing neighbouring modules to make space for it. Clicking the + button at the top right of a module switches it to full-window mode and reveals various mode and view options. iZotope's well-stocked library of task-specific presets is onboard, divided into Audio Analysis, Music Production and Loudness Metering categories, the last packed with setups catering to a range of international industry standard loudness targets and conventions. The presets don't just call up combinations of modules, they also specify module sizes and zoom levels, colours, display settings and the like - and each one is beautifully designed to serve its described purpose. "Spectrogram displays both the frequency and amplitude distribution of the incoming signal over time"
Operating in both 2D and 3D modes, Spectrogram displays both the frequency and amplitude distribution of the incoming signal over time, with the 3D version looking quite spectacular and being fully pannable and rotatable. It also boasts cross-channel analysis. Sound Field is Insight's positional analyser, switchable between mono, stereo and surround modes - named Vectorscope and Surround Scope, respectively. Vectorscope offers three analysis modes: Polar Sample shows individual samples as dots, Polar Level shows the average levels of samples, and Lissajous Vectorscope plots sample dots on an oscilloscope. As well as the current state of the signal, all three modes also show its recent history, fading over a few seconds. The Balance Meter at the bottom of the interface shows the stereo location of the sum of the left and right channels - essentially, the point in the stereo image at which the listener will feel the body of the sound is coming from. The Correlation Meter on the right is used to check for phase cancellation, showing the level of similarity between the two channels (+1 meaning they're perfectly in phase, -1 meaning they're perfectly out of phase). Surround Scope offers the same sort of information, but for any 5.1 surround sound material. Presented as a top-down view, the relative levels of the channels are indicated by the central 'blob', while the white dot is the equivalent to the stereo Balance Meter, showing the point that the listener will perceive the weight of the sound to be coming from. Phase problems are indicated by segments around the edge that light up red when significantly out-of-phase signals occur. "Spectrum Analyzer displays frequency against amplitude on a graph"
Spectrum Analyzer displays frequency against amplitude on a graph. It can be zoomed with the mouse wheel or by dragging a box over the area you want to see close-up, and scrolled by dragging on the two axes. A number of spectrum types can be selected, including Full and 1/3 Octave, and Critical Bands, which splits the spectrum into ranges that reflect the way the human auditory system perceives sounds as 'similar'. The Level Meters module facilitates stereo and surround level metering, alongside BS.1770-compliant loudness metering (Momentary, Momentary Max, Short-term and Integrated). Target volume and loudness levels can be freely and easily set, and combined True-Peak/RMS and K-System options are available. Finally, Loudness History Graph simply shows a graph of Momentary Max, Short-term and Integrated loudness levels over time, with target level violations appearing in red. The graph can be exported as an image or a .csv file, for loading into a spreadsheet application. It also does some rather clever stuff with automation. "This kind of tool can be intimidating, but iZotope has done a superb job of keeping everything as simple and friendly as possible"
At £669, Ozone 5 Advanced certainly isn't cheap, so it's great to see the Insight made available as a self- contained plug-in. 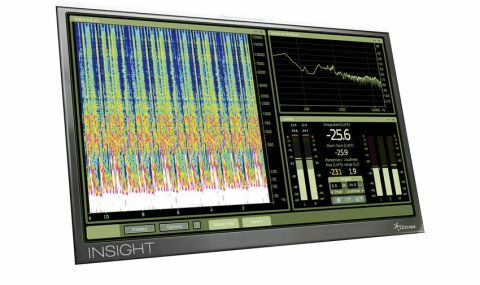 At £375, though, Insight still sits very much at the serious end of the market - as it should, being a tool that's aimed very much at the audio professional. Pro orientation aside, however, one of the main things that makes Insight such a success is just how easy it is to set up and use. This kind of tool can be intimidating, but iZotope has done a superb job of keeping everything as simple and friendly as possible. If you ever need to move beyond the presets (which you may well not), building your own metering arrays is a cinch. The accessible options and settings are deep but straightforward (broadcast industry jargon notwithstanding), and the range of metering types and display styles on offer is expansive. The only question mark for the music producer is whether they really need something this comprehensive. Like we said, this is a pricey bit of software, and much of that price is paying for the higher end of its feature set - the broadcast standard stuff that the home studio-based music producer doesn't really need to concern themselves with, for example. For mastering engineers or post production professionals, then, Insight comes totally recommended - and is relatively affordable in that market. For the musician, even though it offers everything you could possibly need for visualising your sounds and mixes, the Level Meters and Loudness History Graph just won't be all that useful. So, do check out the cheaper, less all-encompassing alternatives available. No doubt, this is as good as signal analysis plug-ins get, but that quality is very much reflected by the pricetag.